Is This Jaguar The Next Royal Limousine? 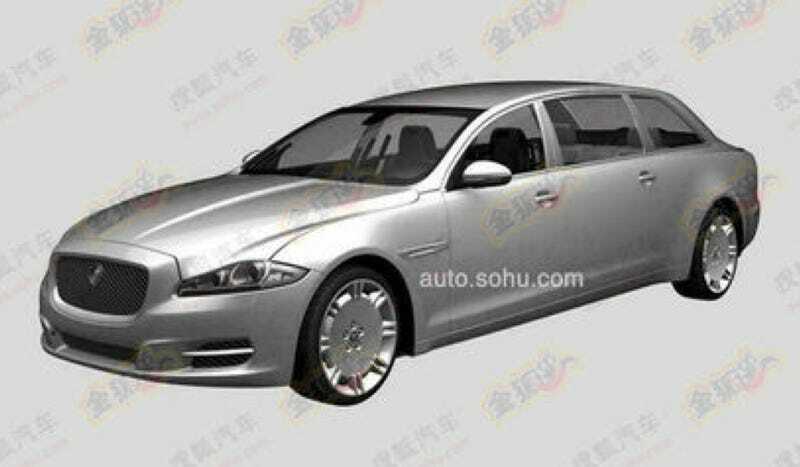 This rendering of a stretched, raised, and deformed Jaguar XJ limo leaked from the Chinese patent office recently. Could Jaguar really build something so ungainly for the royal family? Somehow, I think not. I would expect this car to be a product of an aftermarket coachbuilding firm, as is common for hearses, armored cars, and limos. Car News China seems to agree with me, but Sohu.com believes the car to be the next royal limo. They note its resemblance to the equally-ungainly royal Bentley State Limousine, particularly in the raised, formal rear. I can only hope that Jag wouldn't ever make anything that looks so much like a right whale left out on the beach too long.